Korea is still Korea and I have been spending a considerable amount of time trying to decide if I should renew my contract. With the job market still patchy for lawyers in the States and with many of my law school colleagues opening new firms (which is not really a good sign for the economy), I probably should stay put for now. I miss the States so much most days, but I also know – I get into a lot of trouble when I’m home… That shopping addiction adds up much faster in dollars than in Korean won. I have finally been granted the privilege of teaching a course in my area of expertise. (Did you just hear my bitterness???) I’m low-man on the totem pole here because I’m 1) Not a Ph.D; 2) Don’t have tenure or a tenure track position; 3) Not a man; 4) Not white. After everyone else int he department gets their fill of courses, I take what’s left. It doesn’t help my case that there are no advanced law degrees in Korea – so it feels like a Bachelors Degree to my boss. It also doesn’t help that they love to use my perfect American accent for advertising. I love my returning students, but some of these freshmen are wily. I *think* it’s just a transition to learning proper English, but there is a difference between “can you?” and “YOU MUST.” I don’t respond well to students telling me what grade I should give them on projects they have yet to hand in. I also don’t appreciate students asking me if I am a half-blood/mixed-blood/bad-blood or from a poor family that didn’t teach me Korean. Aiyah. KOREA: You are still in good form. It seems impossible that I have now lived in Korea for a year (well, with those two long vacations back to The Desert). But it isn’t impossible; it’s reality – MY reality. I remember with vivid clarity the anticipation of what it would be like to move to Korea – having so many expectations and also having none at all. I’m not sure what I wanted at that time, except I know I needed life to be simpler. I seem to complicate simplicity so easily, but I’d spent years jumping from one beautiful, albeit sinking, ship to the next, hoping that one would sail me to the Next Best Thing Ever. When I left America a year ago, mostly what I needed was a place and some time to stop jumping altogether. When I came to Korea, I did not come alone. All of the people who encouraged me, supported me, guilted me, threatened to expose me as a whiny baby, loved me, laughed at me, and who stared at me incredulously (Not BF) and then told people, “she’s not really moving to Korea, don’t listen to her…” – these people, my friends, family, loves, and Wagger-Grace, Border Collie Extraordinaire, all came with me to Korea – some in spirit and some in my inbox (and some – Wagger – came by leaving about 2 pounds of Border Collie Extraordinaire fur on all of my belongings). But mostly, the people that love me came with me by creating the version of me who got on that plane, who knew nothing terrible could really happen, and that whatever happened next was entirely in my control. Thank you – I don’t think I was strong enough a year ago to know I could change my life. When I came to Korea, I also did not find myself alone. I may have left my family, my LSA family, and my urban family behind, but I landed into the nest of an Adoptee Family. I cannot express how much I still think of these people everyday. I will never forget walking up and down the rows on that Korean Air flight asking each passenger if they were Jenny (I found her eventually). 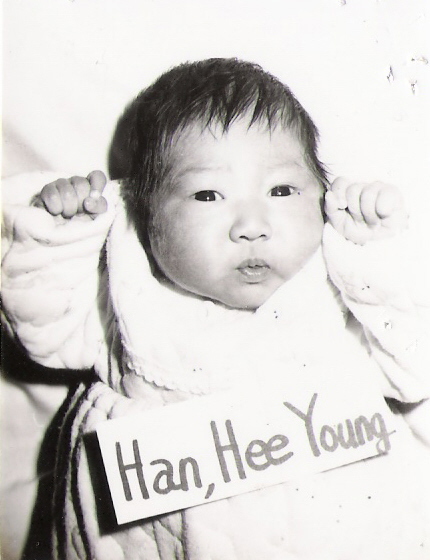 I’m not sure how we all were able to find connections betwixt and between, but I feel like my Adoptee Family from Inje are permanently imprinted as part of me… of part of who makes me who I am NOW. I still incredibly miss Family Dinners. Nothing will ever be as good as Family Dinner…. As I begin to have mini-reunions with my Adoptee Family, I realize there is something there that lets us pick up from a good place… a familiar place. Maybe too familiar. I recently saw Tommy in Gangnam and as I was on the escalator into the subway, he was on the escalator coming up. TOMMY: “Oh, hey.” ME: “Oh, hey. Did you see Mina?” TOMMY: “I assume she’s at the top.” ME: “OK. See you up there.” So much for an emotional reunion filled with excitement. The rest of the night we laughed and caught up and drank wine and it felt like eight months had not elapsed since our last dinner. Except, I was tanner and Tommy has better hair. 😉 So, I was glad to start my second year in Korea, with someone from my Adoptee Family, and with CJ, part of my new KUF (Korean Urban Family) to celebrate her birthday (I’m not exactly sure how old she is in Korean age, so I will just assume she’s my age – 29). Things in the Desert are changing with rapid pace. Things in my old life are falling away, dust is settling. I realize now that I spent a lot of time holding my breath, afraid that the air from my lungs would disturb something I loved: predictability. I stayed the same so that I could stay frozen to a moment in a time – but moments are fleeting, so instead, my life became a recycled version of former moments. I was restless. I was static. But I knew exactly what to expect. Maybe now, I can’t predict the future, or even tomorrow, but… I think… maybe I’m not supposed to know everything that happens next.